hey kids - anyone else out there got dibs on one of the 2007cbr600rr's as they hit the showroom floor in about a month? i have read extensively on the new 07 model and it is said to be very scary, scary cool. I saw some pictures. Looks awesome! 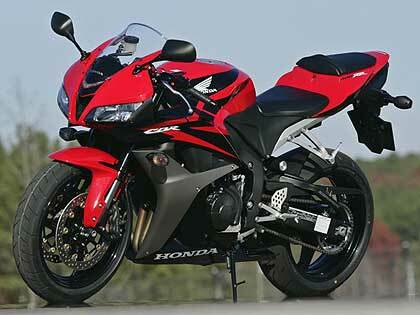 The 07 cbr 600 is far better than last years model. The suspension is the only thing that has'nt changed. Everything else has. Frame,engine and bodywork are all new. It has more HP than before at 118bhp available at 13500 rpm and output increase in the 7000-10000 range. Way better handling than the yamaha R6 or the 06 cbr. Has a electronic steering damper as standart and you will only notice the damper when you are steering at around 60mph. By the way wellcome to the forum.